The Directed Lie uses mechanical drawings, video and sculpture to explore the difference between what we see and what we know. 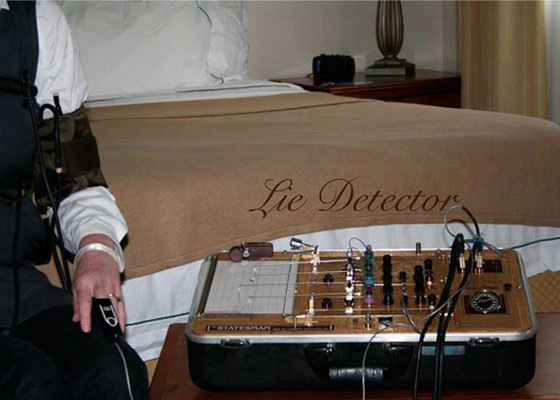 In 2009, I trained as a lie detector in Baltimore, Maryland, where I developed interrogation and lie testing skills and then focused on creating an archive of the art world i inhabit. Thus far I have conducted 238 interviews in Toronto, Halifax, Paris, London, Dublin, Montreal, Vancouver, Banff, Venice and New Smyrna Beach, Florida. In each interview, the subject is asked to answer 33 questions while attached to a polygraph. The instrument produces mechanical ink drawings that indicate “a knowledge” that resides in the body through the measurement of blood pressure, heart rate, and electricity. We get to watch this process, both the activity of the machine and the concentrated, vulnerable face and body of the interviewee, accompanied by the artist's off camera voice. By bringing the controversial science of polygraphy into the realm of art, Phillips accesses a conversation about our complicated ideas of truth and judgment, about authority and language, and about the performance of the self.